Spring has sproinged! And what a beautiful spring it has been in the PNW. I don't know about you, but this past winter reminded me of a black and white movie! While I do love old cinema, I really enjoy a splash of color every once in a while. There is no season other than spring where things are at their greenest. The newly emerging grass, the bright shades of moss, fresh seedlings sprouting everywhere you look....And if you look way up...Way, way up...Up to one of the tallest trees in our coastal forests and you will see the most brilliant shade of green dangling against a bright blue sky. Can you see them? Ok, incase you are inside sitting at your computer while reading this, (caught you!) I am talking about Big Leaf Maple tree Blossoms! Whhhaaaaa? Maple trees have blossoms? Yes! And you can eat them? Yes! And maple trees have many more uses other than just furniture and syrup?!? Yes! 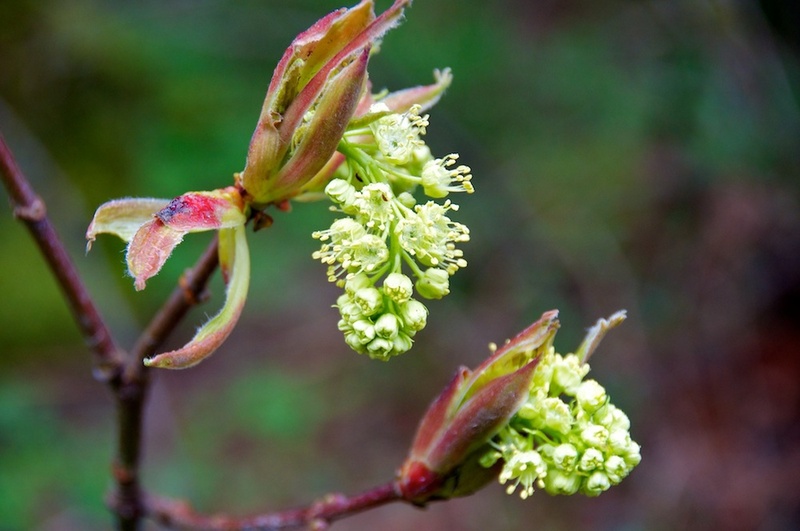 Finding a native maple tree is relatively easy if you live in southwestern B.C. They can get up to 36 meters full grown! They thrive in moist soils (most soils around here) and commonly grow alongside alders, cottonwoods, Douglas-firs, cedars and hemlocks. So, if you are looking at a forest in this part of the globe, you are sure to see a couple of maples. If you are STILL unsure.... look for trees with grey-ish brown bark usually draped in mosses, think Florida bayou style. And of course, at this time of year, you should be seeing beautiful florescent green blossoms dangling off it's leaf-less branches! Have fun collecting, and adios for now!